Can we talk about how inexpensive this activity is?! 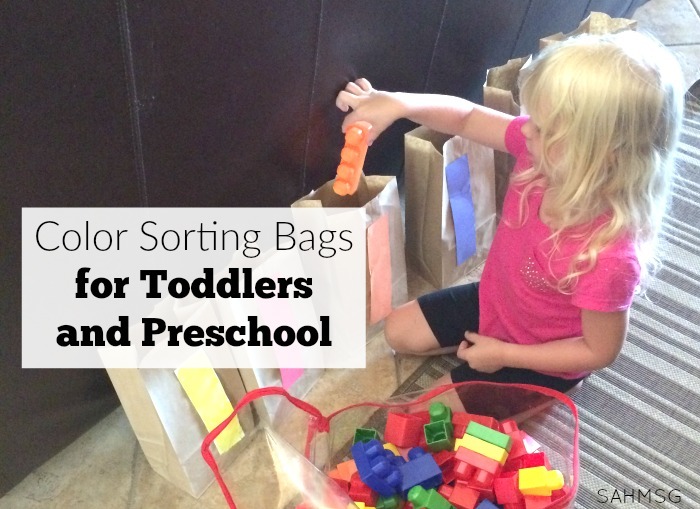 Color sorting bags for Toddlers and Preschool cost very little because the supplies you need are paper lunch bags, tape, scissors and construction paper. I would guess you have at least two of those supplies at home already. I used 5 different colors of construction paper-you can choose as many or as few as you think your child can handle. I made this learning activity for my preschooler and my toddlers. My toddlers were a little young when we did this, but 2 1/2 year olds can probably handle it. 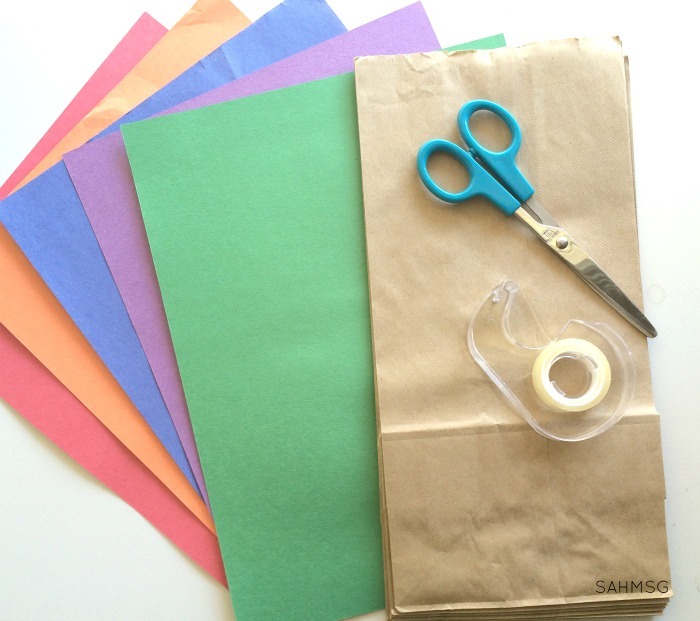 To create the bags for sorting colors, I cut a strip off of each piece of colored paper. Using double stick tape I taped the strip to one side of a paper lunch bag. 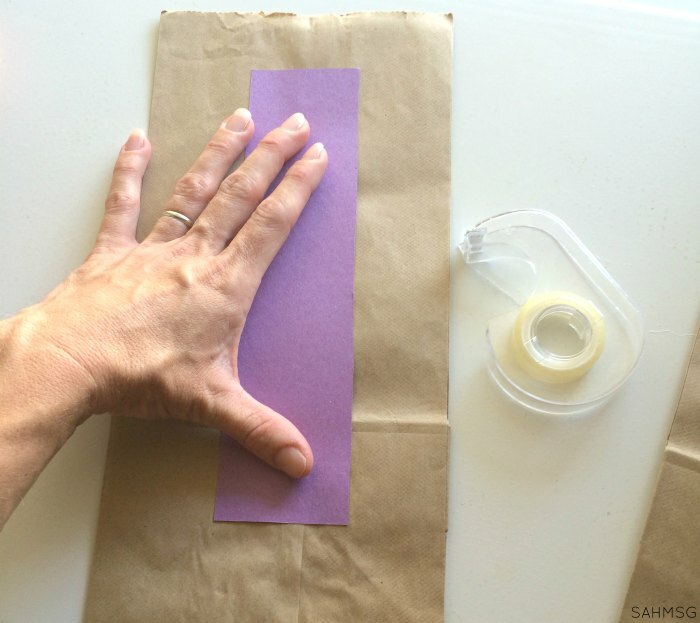 Then I repeated this step to tape all the paper strips to bags. 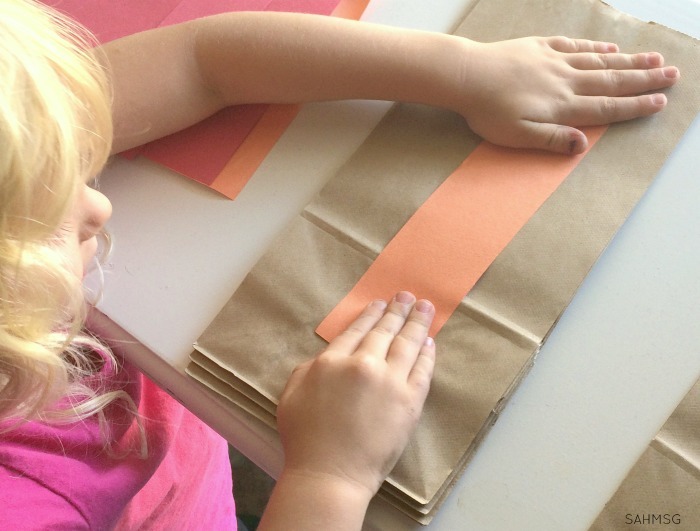 My preschooler even helped because this activity is so simple to create! You can use any kind of tape you have at home. If you do not have paper lunch bags use plastic bowls, or paper plates. You can create this activity so quickly. It sets up easily too. We opened the bags and lined them up on the floor. Jumbo blocks were out sorting tool, but you could use Duplos or even wooden blocks of different colors. Really anything that is multi-colored in your house would work: think socks, Legos, etc. My preschooler acted as the teacher with her toddler siblings helping them learn to say the color names. At the time, my twins were just two years old. For them this was a little advanced. My preschooler could handle it well, though. 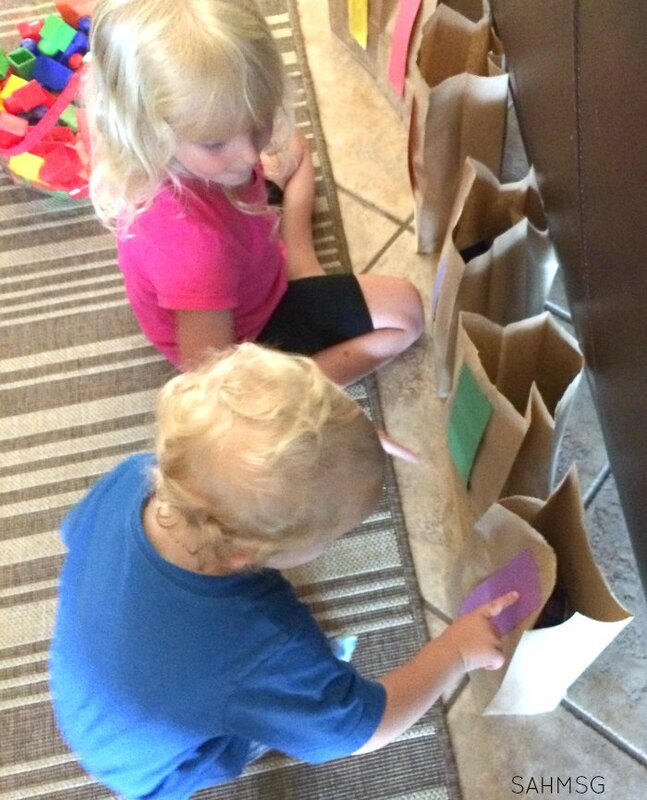 To play, the kids pick a jumbo block and match it to the bag of the same color. Then they drop the block into that bag. Repeat over and over until the bags are full or the blocks are all sorted. After sorting, to extend the activity, dump out one bag at a time and count the blocks of that color. It’s great for children to learn in a multi-disciplinary way. Using language and other cognitive skills together enhances their learning and makes the activity more fun for you too. 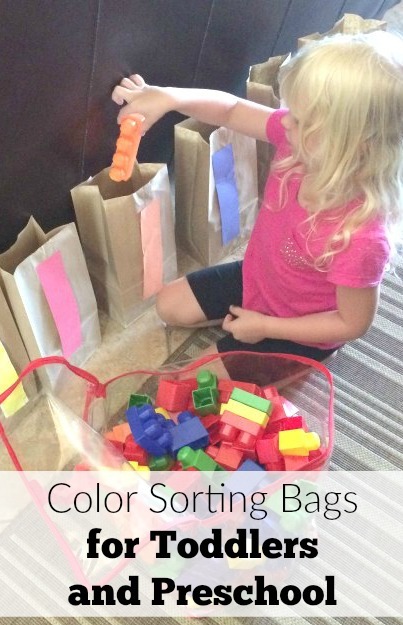 Please pin the image below so other parents can try this color sorting bags activity with their kids! What skills are you working on with your child right now? Is color sorting part of your activities?